Looks like a good step again. No, 4.25 is the latest final version. Got my module. Quick question. It seems I need to power BX3 on first then module otherwise it's not detecting notes if I power hx3 on first. Is that normal? Don't know, but why do you care? If that sequence of startup works 100% of the time does it really matter? Just follow that sequence. It might be that is what is normal for your 15+ year old BX3 and has nothing to do with your HX3. Had a few days with HX3. Sounds great, chorus needs some adjustment. It's on factory at the moment, and I would say it's not any better than the KeyB Duo Mk1 from 2008 I had, in its current factory state. Not a bad thing. But I'd expect to be able to get closer to my C3, if I could be bothered to sit in a cold garage side by side with them. 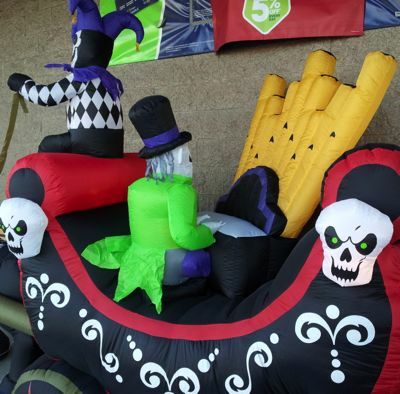 A UHL X3 would save you the sitting in the cold garage! You may think the chorus is great out of the Gemini box, I may not have the same opinion. A lot of people think tne HX3 is 'great out of the box", I may disagree. Opinions are like.....well you know the rest. That's rather a precise tweak time you have given me. When I asked about the switch on procedure being normal, your first two words were "Don't know", but then carried on anyway. Any need to have even replied? Don't shake your head too much, concussion is a serious risk. Don't have any experience with the HX3 but lots of experience with midi and software. So the power up sequence for the HX3 requires the controller to be on first so the HX3 can sense it, identify the type of controller and configure itself for it as part of the HX3 boot sequence. 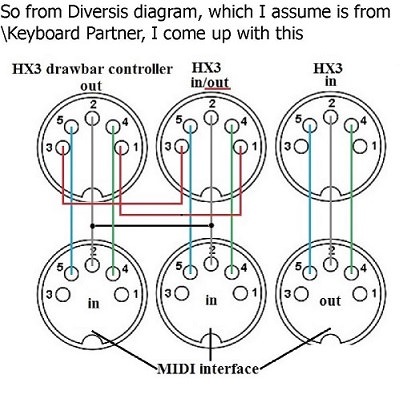 If the HX3 doesn't sense the type of controller if the HX3 is powered up first then that just means the HX3 is not "plug and play", although I guess you could go into the HX3 settings and select the connected controller. No big deal as Dave said, keep to the power on sequence of controller first then HX3 and all good. No different to the recommended sequence for booting a board, mixer and powered speaker. The chorus at the moment sounds more like my friends 1950's B3, once again not a bad thing, but having used an early 70's C3 for 20 years, there's more going on with the chorus than the B3 my friend has. Other than that tne tone is really good, better than the KeyB, the C2D I owned the last ten years. Running it through a Speakeasy preamp into a 145 which will be my gig rig. If you're going to quote me then fully quote me. I don't know the answer because, as I said in my quote, it could be the HX3 being the reason there needs to be a specific order, OR, it could be the BX3 needs to be turned on first, not sure. But the fact that you had a procedure that worked the question doesn't seem relevant given the BX3 is in the mix and it could be that driving it. Turns out it was neither one. Even Markay said this: "..No big deal as Dave said, keep to the power on sequence of controller first then HX3 and all good. No different to the recommended sequence for booting a board, mixer and powered speaker..."
That’s was a fun demo. Traditionalist with taser and good feet. So is that an A100 and HX-3 sharing parts? His expression controlled both sources so had either had 2 x separate on one both. Hard to tell as they follow each other a lot. Bet he’s got a fun gig. soon as I have budget to spare. Glad this thread is open again... I have had my ( latest) HX3 for about a year now, and there is a lot to like about it. The CV adjustments nearly drove me crazy! I am glad I now have a Viscount Legend Live with no CV adjustment. The HX3 CV ( 4.22 BTW) is good but I still think that the upper register could stand an update. 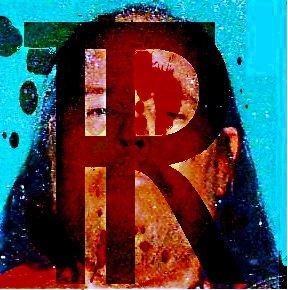 Playback source is crucial but through some playback sources the vibrato " throb" is still too intense - starting around the highest " A" note through the highest " C". The thing that separates the Mojo and the Legend is that there is none of this. I do not have 4.25, not sure if that addresses this issue and I am also not sure that I am not the only one who notices this. The CV in the midrange is fine. The thing I like about the HX3 and that makes me want to keep it is the clarity. The leslie sim is also excellent, but I still use CV alone the most - with no sim. I would love to communicate this CV issue with some of the designers. Perhaps it can be resolved in my case. Tom at Diversi doesn't seem to get it... I have discussed it with him several times. I use the Scope XITE-1 because for years you can use the SDK and tweak, create the synths, FX, Dynamics and mixers to your Hearts content. Keyboard should release an SDK so everyone gets exactly what they want. I agree the HX3 works pretty well in a live context. Speaker selection and volume level have a lot to do with tone and response. I have said many times - with clonewheels I generally like to use a full range speaker without a high frequency driver in the Mix. With something like the EV Force 12'' ( somewhat of a classic I suppose) I get all the frequencies with none of the shrillness. In an ideal situation, some EQing would be nice but in the real world, most of the time its just plug in and play. The easiest thing to do is just plug into something like a powered monitor. For clonewheel 9 times out of 10 I will throw a t shirt over the horn, and see if I can't get what I need out of just the woofer. That's why percussion volume control on the Legend Live is so neat. On the HX3 the percussion volume is deep into the edit screen, but adjustment is do-able. The HX3 is a handy little thing to have. I can get a good practice session out of it using a cheap old Casio as a controller, using presets. Or I can add it to a board like anything Yamaha that has crappy organs and get a variety of organ sounds scrolling through presets. I am finding that there is another way to smooth out the CV on the HX3. Back the drawbars off from 888000000 to 777000000 or even 666000000. Then adjust percussion volume accordingly. This takes care of the " throb" issue in the upper octave. It sounds relatively similar but pulling those bars out all the way on the HX3 creates a problem in the CV to my ear. I do this all the time on my B-3, to increase the bass. I don't know why I didn't think it might affect the CV in the HX3 but it does. It smooths out those upper octave issues. 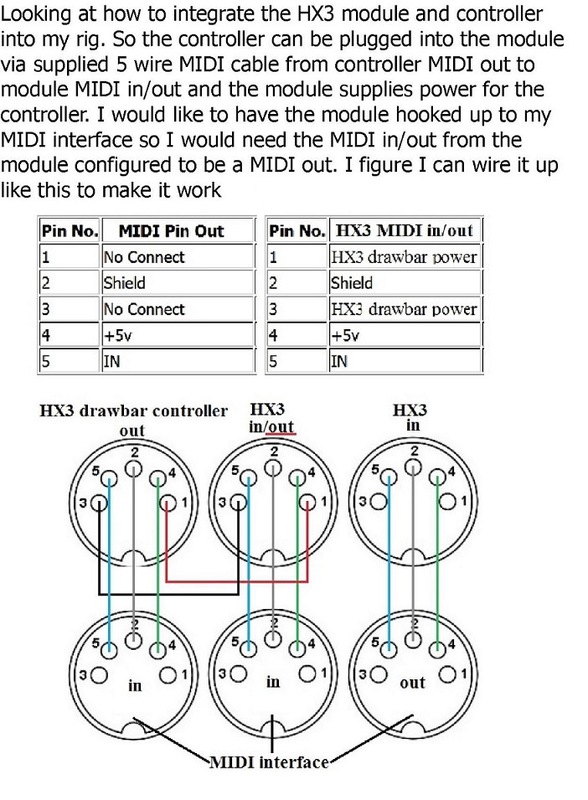 Are you saying you are going to jumper pins from input to output midi jacks? Doesn't sound right to me either. 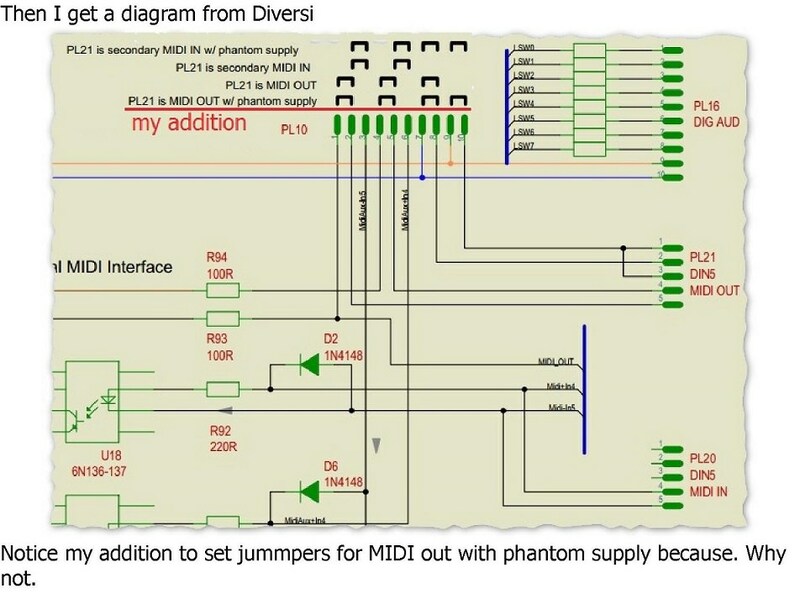 Even if you are only talking about normally unused pins that you want to use to carry power, the founding principle of midi was that the inputs are optically isolated, no? I don't know how all this would work. I had a friend who used to get Hammonds and then immediately start to tear them apart.A few times he got things to work ( like adding percussion to a Hammond model H) but in the end, all he had was a Hammond junkyard. And on gigs , he really used to p..s people off because he had to do an individual - most of the time loud- soundcheck on his new " creations". One time I watched him tear apart a very low serial number 1937 Model BC.I checked the Hammond age list and only a few people like Sal Azzerelli had older instruments than this. It should have been in a museum. Fortunately, I rescued my model 30A Leslie from him - which had been paired with the BC. He seemed to think that any Hammond that didn't have percussion or any leslie that didn't have two speeds was basically worthless or should be " modified".